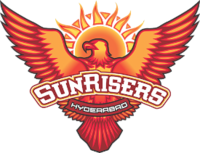 With the new name Pespi Indian Premier League 2013, IPL 6 has replaced Deccan Chargers with Sunrisers Hyderabad. Sun TV Network owns the team founded on October 2013. The team has retained 20 players from old Deccan Chargers. Kumar Sangakkara will be the captain whereas Tom Moody will be coaching the side. Waqar Younis has been named the bowling coach, VVS Laxman and Srikanath will be mentoring the Surisers this season.